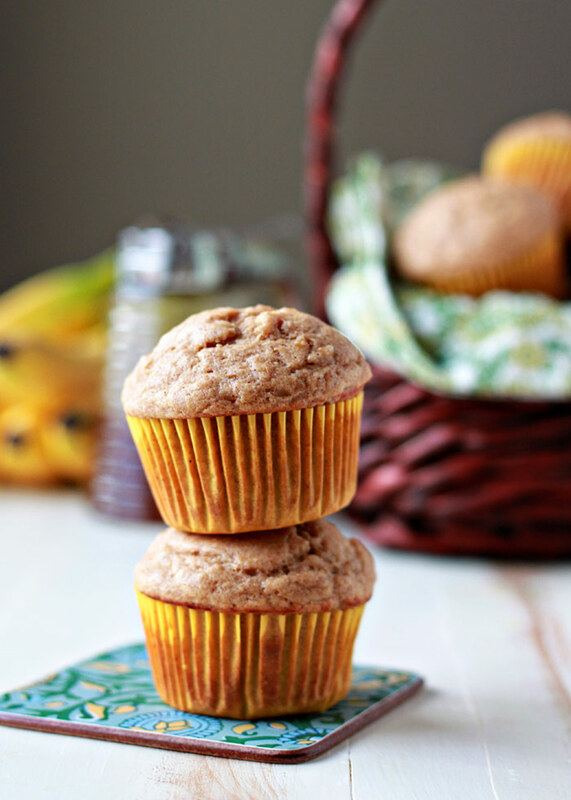 Naturally sweetened with bananas and honey, these moist and easy muffins don’t need refined sugar to make them scrumptious. We’re huge into muffins around here. I probably come up with a new muffin recipe every week. Seriously! Muffincrazytown, I tell ya. In fact, I actually make an active effort to not post too many muffin recipes. So I try to pace myself, blog-sharing-wise. Except it looks like I went too far in the opposite direction last year – I only posted four new muffin recipes for the entire year! So this year, more muffin recipes are clearly in order. 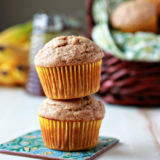 First up: Honey-Sweetened Spiced Banana Muffins. In my effort to be healthier, I continue to move more and more in the “real food” direction. Basically, less refined stuff. These muffins are a good example of that. For the flour, these days, I am partial to organic white whole wheat. White whole wheat flour is made from white wheat, so when it’s milled, it’s whiter in color without needing to be bleached or otherwise refined. I also like how fine and fluffy it is. Perfect for baking. 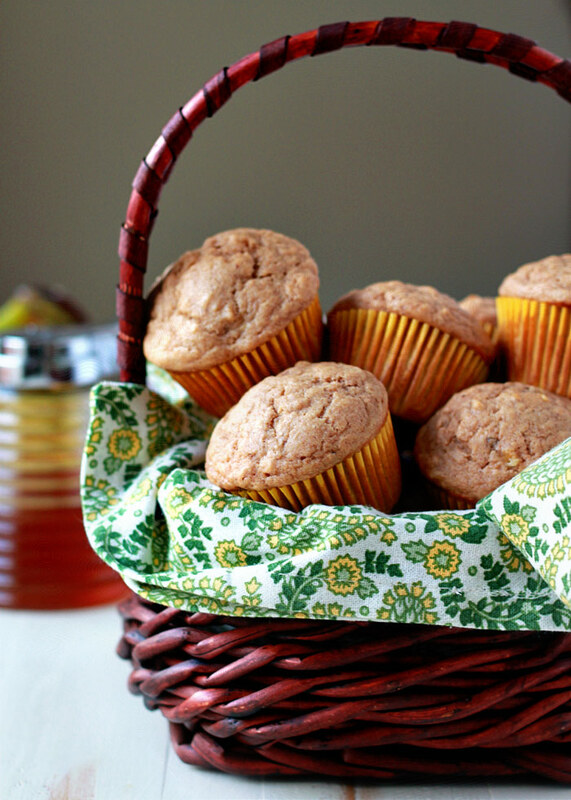 Aside from white whole wheat flour, these honey-sweetened muffins rely on ripe bananas for some of their sweetness, with the remainder coming from – you guessed it – honey instead of refined sugars. I also like how the honey helps contribute to a nice, moist muffin. Plus, I have a hunch it works especially well with whole wheat flour because whole wheat tends to be more absorbent than all-purpose. 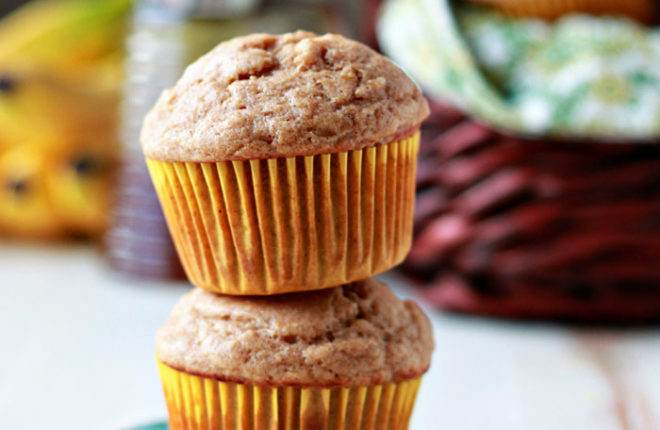 I love how these muffins contribute to a hearty breakfast or make a nice snack in and of themselves without making you feel like you just ate a cupcake for breakfast. Preheat oven to 400 degrees Fahrenheit. Grease 12 standard-cup muffin tins or line with liners. 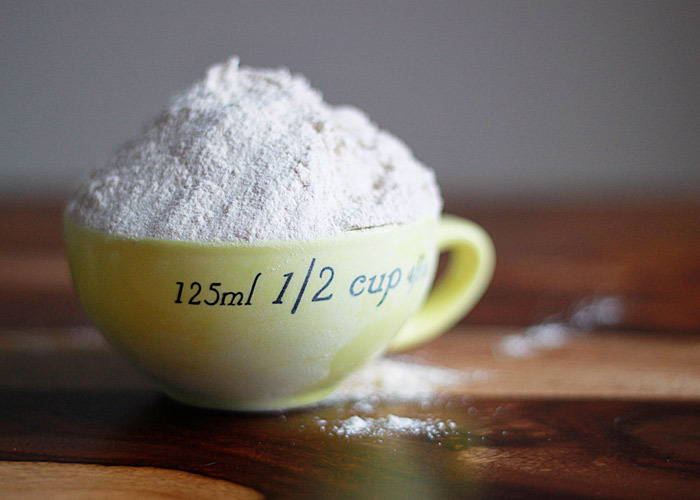 In a large bowl, whisk together the flour, baking powder, cinnamon, nutmeg, ginger, and salt. In a medium bowl, mash the bananas. Stir in the butter, honey, and egg. Mix well. Add the milk and vanilla and mix until blended. Pour the wet ingredients over the dry ingredients and, with a wooden spoon or spatula, mix just until incorporated. Divide batter between muffin cups, about 1/3 cup of batter each. Bake until the tops spring when you touch them and a toothpick inserted into the center of a muffin comes out clean, about 12 minutes. 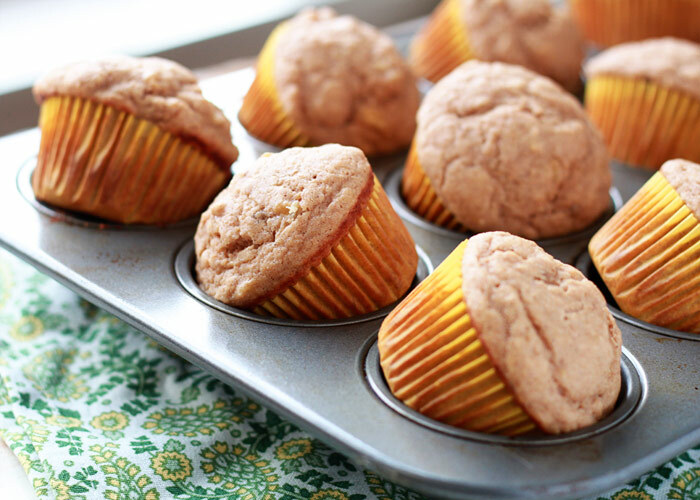 Muffins keep in an airtight container or zipper bag at room temperature for 3-4 days. They also freeze well! * If your bananas aren’t VERY ripe (and therefore aren’t at their sweetest), you may want to increase the honey to 1/2 cup to compensate. I need to go to muffin town soon! I made these muffins this morning, and they were delicious, but I found the baking time of 12 minutes was not nearly long enough! I ended up taking them out after 15 minutes, but they were still undercooked so I put them back in the oven for a few more minutes. Did you find your muffins were completely cooked after just 12 minutes? I’m wondering what went wrong for me. I just made these and they are delicious! Mommy & toddler approved. I too found that 12 minutes wasn’t quite enough time. I took them out around 15 minutes and they are still slightly underdone on the bottom, but perfectly delicious. Thank you! The temperature is perhaps on the higher side? Mine burnt on the surface and were all gooey inside. I cut out the nutmeg and ginger and added chocolate chips instead. Got delicious banana chocolate chip muffins. Great recipe! These are very good muffins and I will definitely save the recipe! Next time though, I will add a bit more spices and some walnuts or pecans, as I like very spiced, nutty muffins. Thank you! A great afternoon snack for the whole family!! I have a fan oven so set it to 180 degrees which is the fan equivalent… mine were raw… put them back in 3 times… definitely need the oven at 200 degrees not the fab recommended …. What shelf in the oven works best??? Higher or lower in the oven?